Subaru: the all-weather, all wheel drive monster. My WRX is an amazing car, it is a champion of all seasons. Winter driving is the easiest thing ever with Subaru's all wheel drive system. The car gets to become a maintenance machine when you start extensively modifying it, which I have done, but it does not stop me from enjoying the car I love. It drives great, sounds great, and it gets compliments all the time because of the sharp looks. The car stands out in any situation, it is an all wheel drive rally-inspired monster to drive. I have replaced the sound system with one that is a bit better and I think it was a good investment. The seats are very comfortable for long trips, and the interior is very good quality. I have not had any major issues with the car, because I keep up with regular maintenance. The things I have changed besides the radio is the wheels, suspension and a few performance modifications. The car is an amazing daily driver and I will continue to only drive Subaru cars. Great handling in all weather. 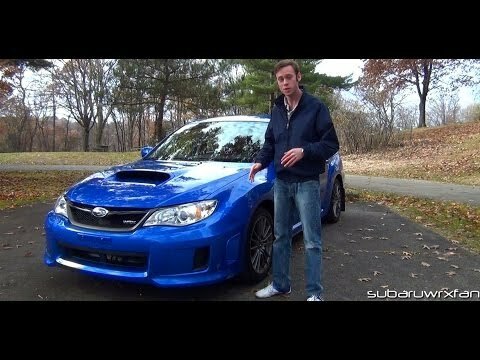 2013 Subaru Impreza WRX Premium edition. AWD, 265 HP, manual 5 speed transmission. Purchased used. (Previous owner was rough on the car, and did his own repairs, badly, which voided some of my warranty.) Great handling in all weather, quick, responsive. 2013 model has heated seats, but back only, not seat itself. Seats are a bit uncomfortable for long distance driving, though adding a seat cushion helps. Comes with single CD stereo, but Bluetooth and AUX input capable. Has fog lights, though the car sits low and the fog lights do not really help. Added window vents, but the angle of the back windows makes it so the vents do not prevent rain from coming in. (Front vents work fine.) REQUIRES PREMIUM GASOLINE. Spare tire included. The WRX handles great in all types of weather! Overall, it is fun to drive! The WRX is a fun car to drive. It has great pick up and is pretty to look at. The interior is comfortable but not luxury. I wish I would have upgraded to a more luxury console but it works great. The winter tires make the WRX a great vehicle for the winter months, as we get a lot of snow around here. The summer tires are great for tight turns and “joy rides”. The Bluetooth is something I use often but wish I didn't have to connect manually every time I get in to the car. Overall, the WRX has been very reliable with little maintenance and the dealership we go to has always been very helpful and efficient. I would definitely buy a Subaru for my next vehicle, though I'd think about going the limited route for extra comfort.